Lukas Graham the Danish pop, punk and soul band has taken the No: 1 spot on the UK singles chart with the song ‘7 Years’. The track is the band’s debut UK release which took 105,000 combined sales to register the chart topping position. In total ‘7 Years’ has over 200,000 combined sales from two weeks of release and has been certified as Silver by the British Phonographic Industry (BPI). Lukas Graham is the third act from Denmark to top the UK singles chart after Whigfield did it ‘Saturday Night’, in 1994 and Aqua with ‘Turn Back The Clock’ in 1998. 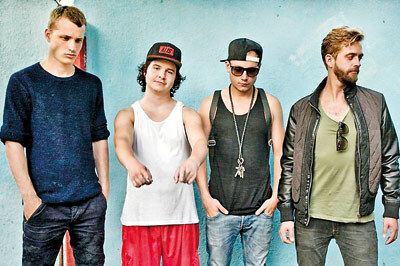 Lukas Graham Forghammer is the leader of the band with other members being Mark Falgren, Magnus Larsson and Kasper Dangaard. The quartet has been together since 2011 and popular in Denmark since 2012. Where they scored five No: 1 songs. They soon got noticed in the rest of the Scandinavian region. ‘7 Years’ has taken Lukas Graham to new region with success. The pop, soul track is written by the band leader with Stefan Forrest, Morten Ristorp and Morten Pilegaard. ‘7 Years’ is taken from the album ‘Lukas Graham (Blue Album)’. The sole song to get through to the UK top 10 is ‘Secret Love Song’ by Little Mix featuring Jason Derulo. The r&b ballad had a very slow climb to the top 10 taking six week since it debuted at 66. The song is taken from the all girl group’s third album ‘Get Weird’ and is their eight UK top 10 hit song. Barry Manilow who had fallen ill last week pulled himself to perform at the Clive Davis, pre- Grammy party on 14th February. The 72 year veteran was hospitalised in the middle of his One Last Time, farewell tour in Texas on 8th February and then rushed back to hospital on 11th February owing to complications from emergency oral surgery. Davis has arranged for Carly Simon to replace the ‘Mandy’ hitmaker when he made it to the party. Max Martin, the Swedish song writer and producer has been named as the winner of the Polar Music Prize for 2016. The 44 year old who has penned hit songs for Justin Bieber, Britney Spears, the Backstreet Boys, Adele, Katy Perry, Pink, Taylor Swift, the Weekend and several others will receive the award from Sweden’s King Carl Gustav in Stockholm on 16th June. City officials in the town of Royal Oak, Michigan, US have voted to name a stretch of road after the late Glen Frey of the Eagles who died on 18th January. Frey was once a pupil in a school in the area. The Rolling Stones were under a 24 hour guard during their concert tour of Argentina after one of the group’s local workers was shot dead after a failed robbery on 11th February. The incident took place after the Stones had finished their concert at the La Plata Stadium in Buenos Aires. Ariana Grande has parted ways with her co- manager Scooter Braun after three years. She will however continue to work with her long time manger Stephanie Simon.